Ten people, including three members of the Turkish Communist Party (TKP), were sentenced to 11 months, 20 days in prison for allegedly insulting President Recep Tayyip Erdoğan, Cumhuriyet reported on Saturday. According to the report, 10 people were accused of insulting Erdoğan in a press statement in the Salihli district of Manisa province following a bomb attack in Ankara in 2015. One hundred two people were killed in a terrorist attack carried out by Islamic State in Iraq and the Levant (ISIL) militants in Ankara on Oct. 10, 2015. The appeals of the 10 people were rejected by another court. A Panamanian-flagged vessel was forced to dock by the Turkish coast guard while it was sailing through the Dardanelles on Thursday after its Turkish captain allegedly insulted President Erdoğan in radio communication. 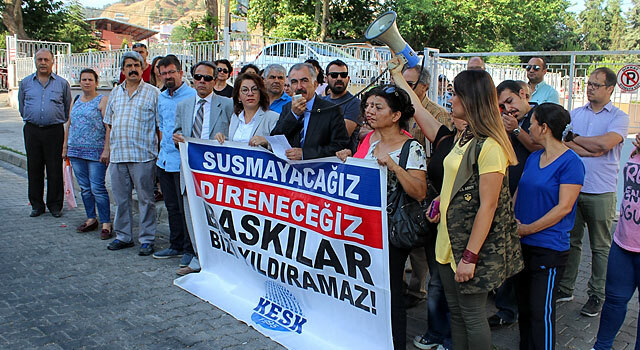 In May, five people were arrested in the southeastern province of Şanlıurfa on charges of insulting Erdoğan and disseminating the propaganda of the outlawed Kurdistan Workers’ Party (PKK). Similarly in May, Kardelen Aritman, a university student, was sentenced to house arrest in Adana for insulting Erdoğan by retweeting a tweet. Scores of people in Turkey have been detained or arrested or are under investigation on allegations of insulting Erdoğan. This article originally appeared in Turkish Minute on June 10.